It was getting near to my sister’s birthday so I knew it was time to plan a special card for her. I choice a design from my Bridal Lace 2 collection and one from Graceful Wings 1. 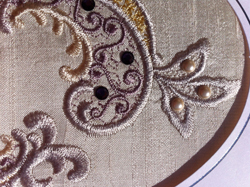 Bridal Lace 2 2_3 would embroider out my 5″ x 7″ hoop and fit into the oval cut out on my card. This is the finished card which wasn’t exactly what I was trying to achieve as I would have liked the dragonfly’s body to be outside the card! However my sister was delighted with it and I thought I would explain how I created it, especially as another set of designs in the Bridal lace 2 collection is due out this week! 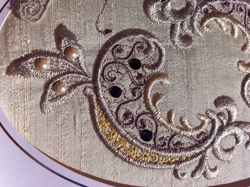 I stitched the bridal lace design out in Sulky threads using Tawny Tan 1055, Ecru 1082, Silver 1085 and Taupe 1213 on to ivory silk which had been prepared with a Vilene G700 backing to give it extra stability. 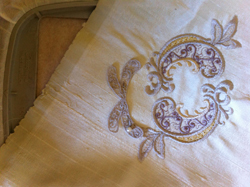 I then removed it from its hoop, trimmed all the jump stitches and pressed it from the back. 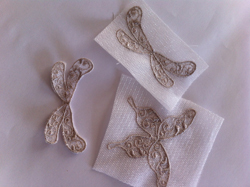 To bring the embroidery alive I wanted to use some of the Graceful wings designs so I stitched out a selection of them on polyester crystal ivory organza in 1085 eliminating the last colour which stitches the body and antennae. 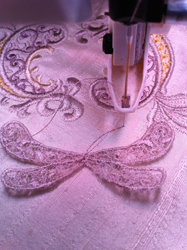 The organza was hooped with Florani Wet N Gone and then after embroidering them out I trimmed, rinsed, dried and pressed my appliques. 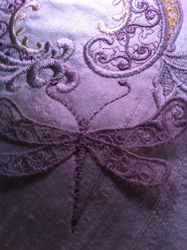 I choose the dragonfly and hooped a 4″ x 4″ hoop with stitch and tear, and loaded up the Graceful Wings design again selecting one with Outline alignment stitches (OAS). I stitched the first outline on to my stabiliser so I could see where the body and antennae would stitch when I applied the wings to my card. 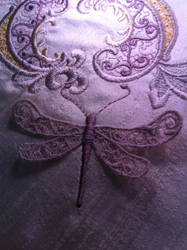 I place my first embroidery inside my card and then decided where to embroider the dragonfly in place. When I was happy with its position I secured it with a pin. You may want to use a few stitches instead. 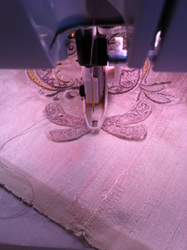 This is the tricky bit where you place your embroidery on to your hoop which has the outline of the dragonfly stitched on the stabiliser. Spray the stabiliser with temporary adhesive and do this well away from your machine and computer! 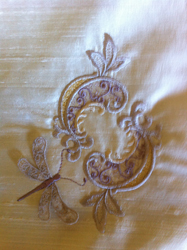 Do check under the embroidery to see if your dragonfly is sitting within the outline. 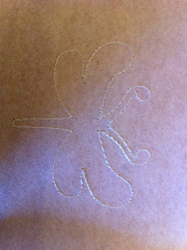 I found that when I started to stitch the body and antennae I could adjust the position of the motif a little if required! 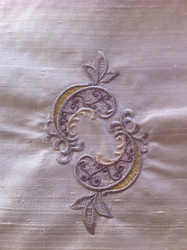 When the antennae have stitched out stop and make any small adjustment to the motif as it is only held in place by a few stitches. Make sure the antennae are lined up correctly. When I was happy I finished off the embroidery. Here is my finished dragonfly ready to be pressed and put inside the card! 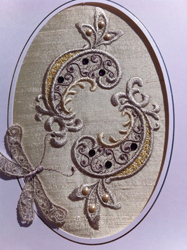 Position your embroidery inside your card making sure it is correctly lined up. I add an oval shape of fleece behind to make the embroidery stand out! I use double sided sticky tape to attached the embroidery into the card. To complete the card I added pearls and dark crystals. I decided not to add any to the actual dragonfly as it appeared to over do it! I was delighted with my finished card although I would have liked the whole dragonfly to be outside of the card. 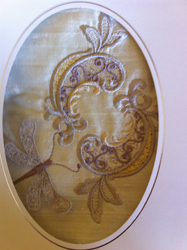 To do that I would have had to combine the antennae on to the bridal lace design in my software. The dragonfly would also have to have been edited by removing the antennae and stitching out the body as well. Now there’s a challenge for you all! I have so enjoyed sharing this project with you all and hope that it has been useful. Remember to take photos of them especially if you are sending them to family or special friends. Then you have a record of what you have made in the past! 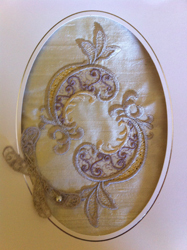 Do let me see your cards if you embroider some and I please visit me in my studio again soon! 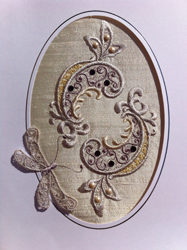 This entry was posted in Embroidery projects and tagged 3 Dimensional embroidery, Making embroidered cards. Bookmark the permalink. Thank you Hazel for sharing how you accomplished your card, sure wish I had a sister! Hazel, You have created an absolutey gorgeous graceful combination. You ave a very lucky sister.